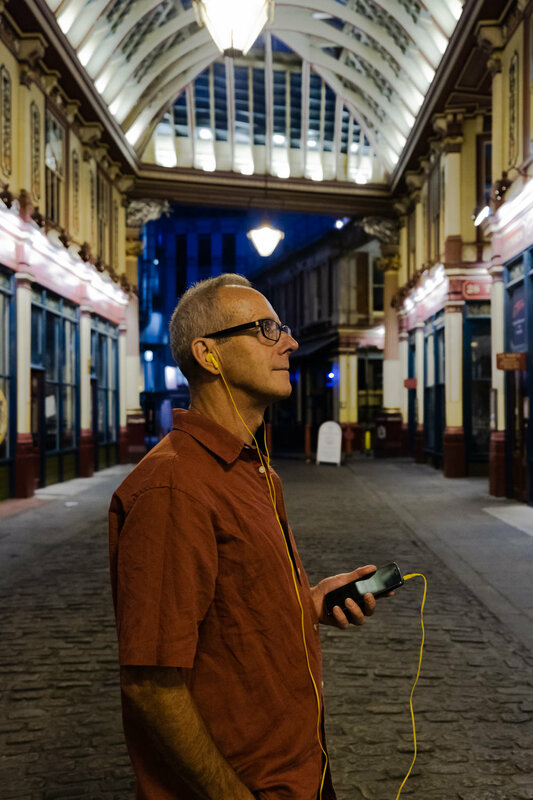 the piece can be listened to 24/7 by using (preferably good) headphones/earphones and connecting a handheld device to the Musicity webapp on your smartphone at Leadenhall Market (London). This site-specific sonic work is Kakinoki’s response to Leadenhall Market. Among the several options of the places in City of London suggested by the commissioner, Kakinoki chose the place because of his ongoing research interest in the food culture and human history. Considering the market’s historical identity as a fresh food market, the market has changed a lot, while its streets and alleys remain almost identical to what they used to be hundreds of years ago. Fenchurch Street, Leadenhall Street, Lime Street, Gracechurch Street, which surrounds the market today, can be found in the A to Z map of Elizabethan London made in around 1560. Kakinoki's research went from the old maps of the area, the historical books on the subject, the literary works and the advertisements in different centuries depicting the past of the market, to the food history of England around meat and fish. Along with the research, Kakinoki visited the market at different times to observe it, eat and drink in the shops, talk to the merchants of today, and soak himself into the visible and invisible history of it. In the work, the conflicting layers of the spoken words on the multiple aspects extracted from the researched histories, the field recording of Kakinoki walking in the current market while talking to himself and people at different hours, and the noisy interludes generated from the sounds recorded at the site including construction work, invite the audience to dive into the place, with various elements including historical dynamicity, transience and dignity inherent in the market. The spoken words were read by artist Doran Edwards, whose family have roots in East London, and his accent provides another layer to the piece. Anonymous. 1720. Plan of Leadenhall Market and the East India Warhouse. Crace Collection of maps of London. Anonymous. 1765. A Plan of part of the City of LONDON, from the Bank, to Leaden Hall Street, Including the Houses destroyed & damaged by the late Fire, in Bishopsgate Street, Cornhill &c. Nov.r 7.th 1765. London: Printed for JOHN RYALL, at Hogarth's Head in Fleet-Street. Anonymous. 1898. Sir Gawain and the Green Knight: A Middle-English Arthurian Romance [Online]. London: David Nutt. Available: http://d.lib.rochester.edu/camelot/text/weston-sir-gawain-and-the-green-knight [Accessed 19 July 2018]. Archiseek. 1729 - East India House, Leadenhall St., London - Architecture of London, Vanished London - Archiseek - Irish Architecture [Online]. Archiseek.com. Available: http://archiseek.com/2012/1729-east-india-house-leadenhall-st-london/ [Accessed 19 July 2018]. Blome, R. 1754. A mapp of Lime Street ward. : Taken from ye last surveys & corrected. Chaucer, G. 2012. The Canterbury Tales (Penguin Classics), Penguin. City of London (England). Department of Planning 1996. Leadenhall Market : Conservation Area Character Summary, City of London, Department of Planning. Cole, B. 1755. A new and correct plan of Limestreet ward with its division into parishes : according to a new survey / B. Cole sculp. London. Dickens, C. 2012. Oliver Twist (The Penguin English Library), Penguin. Dowling and Son 1877. Ye Historie of Leadenhall [Market]. Exploring London. 2015. Lost London – East India House… | Exploring London [Online]. Exploring London. Available: https://exploring-london.com/2015/05/22/lost-london-east-india-house/ [Accessed 19 July 2018]. Fisher, J. & Cline , R. 1992. The A to Z of Restoration London : (the City of London, 1676), London, London Topographical Society. Map, W., Theophrastus & Jerome, S. 2006. ジャンキンの悪妻の書―中世のアンティフェミニズム文学伝統 [Japanese], 南雲堂フェニックス. National Federation of Fish Friers. Federation of Fish Friers - Serving the Fish and Chips Industry - History [Online]. National Federation of Fish Frier. Available: http://www.federationoffishfriers.co.uk/pages/history--599.htm [Accessed 19 July 2018]. Ochi, T. 2018. イギリス肉食革命: 胃袋から生まれた近代 [Japanese], 平凡社. Ochi, T. 2018. 魚で始まる世界史 [Japanese], Tokyo, 平凡社. Prockter, A. & Taylor, R. 1979. The A to Z of Elizabethan London, London, London Topographical Society. Rocque, J. 1982. The A to Z of Georgian London, London, Lympne Castle : Published for the London Topographical Society by Harry Margary in association with Guildhall Library. Thornbury, W. 1878. Leadenhall Street and the Old East India House [Online]. London: Cassell, Petter & Galpin. Available: http://www.british-history.ac.uk/old-new-london/vol2/pp183-194. [Accessed 17 July 2018]. Williams, T. 2014. The Glass Menagerie (Student Editions), Methuen Drama. Williamson, H. 2014. How Dear Is Life (A Chronicle of Ancient Sunlight Book 4), Faber & Faber. Wilson, C. A. 2003. Food and Drink in Britain: From the Stone Age to the 19th Century, Academy Chicago Publishers. Wisdom, J. 1985. The A to Z of Regency London, London, Lympne Castle, Kent : Published for the London Topographical Society by Harry Margary in association with Guildhall Library.